With Compliments of D. R. Stiltz & Co. 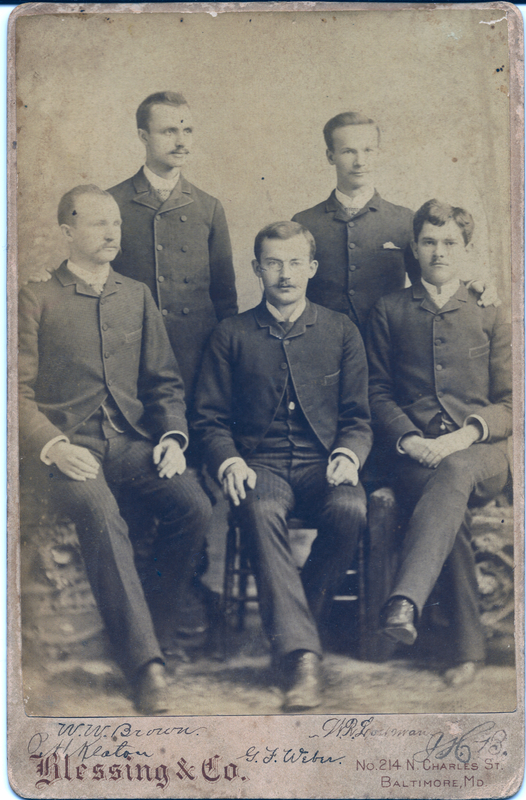 This cabinet card photograph by Blessing & Co. (John P. Blessing and Henry Fenge) is autographed by five young men who all turned out to be graduates of the Baltimore College of Physicians and Surgeons, class of 1888. Perhaps they had their portrait taken as a parting remembrance of their time together. All five are mentioned in a Baltimore Sun article of 16 March 1888 about the school’s commencement ceremonies at Ford’s Opera House in Baltimore: William Rish Lowman from South Carolina; Harris Miller Branham and Peyton H. Keaton from Georgia. George E. Weber and W. W. Brown are mentioned as special prize-winners in the “graded course,” but their state of origin isn’t given. For graduating second in his graduating class, Harris Miller Branham (1862-1938) was awarded the Brown Memorial Prize and a year’s residency at Baltimore City Hospital (Peabody College Alumni Directory). He had come to Baltimore to study medicine after graduating from Peabody College in Nashville, Tennessee and teaching for several years. His parents were Eatonton, Georgia natives Mary Helen Matthews and Isham Harris Branham (1848-1906), a wealthy Georgia merchant and attorney who attended Emory College in Oxford, Georgia, and served in the Confederate armed forces during the Civil War. Young Harris Branham grew up in Fort Valley, Houston County, Georgia, but when he settled down to practice medicine, it was in Brunswick, in Glynn County, Georgia. He and his wife Daisy Tison Branham, are buried in Palmetto Cemetery, Glynn County. Branham’s identification of the signs of a medical phenomenon called an “arteriovenous fistula” earned him an entry in the German version of Wikipedia. His observation was dubbed “Branham’s Sign” in his honor; the story of his medical “eponym” is recounted in a 1985 article in The Annals of Thoracic Surgery by Will C. Sealy. Read a 1906 biographical sketch of Dr. Branham and family in Georgia: Comprising Sketches of Counties, Towns, Institutions and Persons. William Rish Lowman was awarded the Erich Prize for finishing third in his graduating medical class. Born 3 December 1866 in Lexington County, South Carolina, to Dr. Jacob Walter Lowman (1837-1905) and Lodusky (Rish) Lowman (1839-1929), William was descended, through his mother’s kin, from Jacob Long, who served in Water’s Regiment of South Carolina during the American Revolution. Like Branham’s father, Lowman’s father served the Confederacy in the war between the states, but whether as a doctor or as a soldier is not clear. Dr. Jacob Lowman studied medicine at the University of Georgia. After the war, he returned to his country practice. A respected and influential citizen, he was elected to the South Carolina state legislature for Lexington County. According to family and local history researcher Jim Dugan, William Rish Lowman was a pharmacist as well as a physician, and the proprietor of Lowman Drug Store in Orangeburg, South Carolina. Dr. Lowman served as a board member and trustee of Orangeburg’s South Carolina State University. A men’s dormitory, Lowman Hall, was named for him in 1917. The building, which is on the National Register of Historic Places and part of the South Carolina State College Historic District, was completely rehabbed and reopened in 2010 as University administrative offices. William, his wife Elvira (Izlar) Lowman, and his parents are buried in Sunnyside Cemetery, Orangeburg. Dr. Peyton Howard Keaton (1863-1927) of Dougherty County, Georgia, was the son of wealthy plantation-owner Benjamin Washington Keaton (b. abt. 1825). B. W. Keaton had inherited a large portion of land in what became Dougherty County from his father, B. O. Keaton, who died leaving something like 21,000 acres, including dwellings, farm equipment, farm animals, and probably hundreds of slaves. The land appears to have been divided among several sons, including Benjamin W. Keaton. After the death of B. W. Keaton sometime between 1865 and 1870, Peyton’s mother, Laura Henington or Hemington Keaton, married a prosperous merchant of Damascus, Early County, Georgia, and Peyton grew up in the house of his stepfather, Thomas Hightower. Peyton and his friend W. R. Lowman continued their medical studies together at the New York Post-Graduate Medical School and Hospital, and Keaton named one of his sons, Lowman Keaton, after his friend. Keaton died of an apparent accidental overdose of chloroform on 7 December 1927, possibly in Leon County, Florida; records of the location conflict. He is buried in Damascus Cemetery, Old Damascus, Early Co., Georgia. By all accounts, Dr. Keaton died a wealthy man: Owner of 5,000 acres of land, part-owner of dry goods store in Blakely, Georgia and a meat market in Damascus, and vice-president of a local bank. W. W. Brown and George E. Weber present more difficult problems, as their states of origin are not given. W. W. Brown could have been Dr. William Wiley Brown of Limestone County, Texas, born in Texas to Mississippi transplants Wiley Pickens Brown (1837-1918) and Mary “Molly” Z. (Stephens) Brown (1843-1913). Cathy McCormick has documented the life of Wiley P. Brown’s family in Groesbeck, Limestone County, Texas, where William Wiley Brown married May Procter (1875-1938) and settled down to practice medicine. Dr. Brown died in an auto accident in 1932 and is buried in Faulkenberry Cemetery, Groesbeck, Limestone Co., Texas, along with William’s parents. Dr. Brown’s brother, Frank F. Brown, DDS, studied dentisty at the Baltimore College of Dental Surgery. According to A History of Texas and Texans, Volume Four, Wiley P. Brown was born in Tallahachie County, Mississippi and came to Limestone County in 1849 with his parents, whose roots were in South Carolina. Dr. Brown shared with Keaton and Lowman the history of a father who served in the Confederate army. Capt. Wiley P. Brown rode with the 20th Texas Cavalry in Arkansas and Indian Territory during the Civil War. G. E. Weber could have been George Ernest Peter Webber (1872-1930), a Kentucky-born physician who grew up in Missouri, and settled in Morland, Graham County, Kansas with his wife Cora Mather. They are buried in Morland City Cemetery, Graham County, Kansas. Did they ever see each other again after they settled down? State medical associations routinely appointed delegates to attend the annual conferences of other state medical associations, so it is possible that they encountered each other at such gatherings. However life separated them later, their group photograph captures a moment when these confident young southern doctors, graduating at the top of their class, formed an affectionate confederacy of five.